Moonstone, 22 karat gold, oxidized silver. Size 6. Can be sized. Moonstone, 22 karat gold, oxidized silver. Size 6 1/4. Can be sized. Moonstone, 22k gold bezel, sterling silver. 1/2" high x 3/8" wide x 5/16" high. Band is size 7 and 3/16" wide. Can be sized. Moonstone, 22k gold bezel, 18k gold. Band is size 6 and 1/8" wide. Can be sized. Boulder opal, pink and orange sapphires, tsavorite, 22 and 18 karat gold, sterling silver. Size 6. Can be sized. Opal, blue sapphires, 22 and 18 karat gold, argentium silver. Size 6. Can be sized. 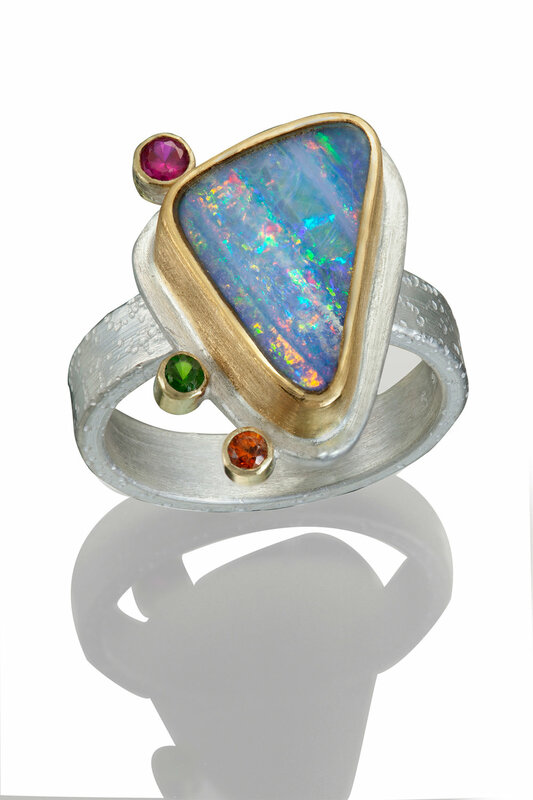 Opal doublet, 22 karat gold, oxidized silver ring. Boulder opal, diamonds, 22k gold bezel, 18k gold. 1" long x 11/16" wide x 3/16" high. Band is size 6 1/2 and 3/16" wide. Can be sized. Boulder opal, rubies, 22k gold bezel, 18k gold tube bezels, oxidized sterling silver. 9/16" long x 9/16" wide x 3/16" high. Boulder opal, pink sapphires, 22k gold bezel, 18k gold tube bezels, sterling silver. 1 " long x 5/8" wide x 1/8" high.